What are the best breast implants for your lifestyle? 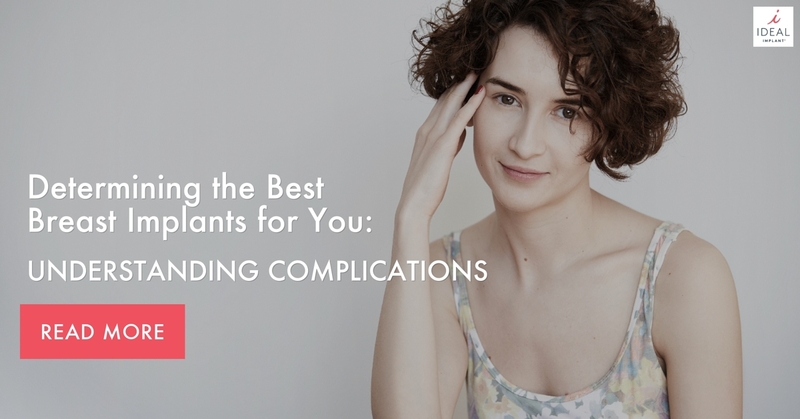 Knowing the potential complications after your surgery will help you make an informed decision. Below we give you an overview of the differences between breast implant types, the most common implant complications, and how you should factor your peace of mind into your decision. There are three types of implants now available from many board-certified plastic surgeons. Saline-Filled Breast Implants: these implants are filled with saline (salt-water) and have a single silicone shell. Saline resembles water in the way that it moves, occasionally resulting in ripples under thin skin. The FDA has approved these implants in women 18-years and older and they are widely available in the United States. Silicone-Gel Filled Breast Implants: as the name implies, these implants are filled with silicone gel and have a single silicone shell. Silicone gel is a more viscous substance than saline resulting in an implant that is stable and does not ripple easily. These implants are also widely available but have only been approved by the FDA for women over the age of 22. The IDEAL IMPLANT® Structured Breast Implant: The IDEAL IMPLANT is new to the implant market and was developed to address common concerns women have with saline and silicone gel implants. The IDEAL IMPLANT is filled with saline, but contains nested baffle shells for internal support. This baffle structure means the implant moves and feels similar to natural breast tissue, despite being filled with saline. The IDEAL IMPLANT® is available from exclusive board-certified plastic surgeons around the United States and has been approved by the FDA for women 18 years and older. The FDA has identified complications that have been reported as a result of breast augmentation surgery using all types of implants. For a full list of the complications that have occurred in at least one percent of patients, visit the FDA website. To determine the best breast implants for you, you need to be aware of these complications and how often they affect women post-op. The FDA reports that the most common complications are capsular contracture, rupture, deflation, reoperation, and removal. A breast implant rupture can be caused by many different factors and can happen at any time during the life of your implant. Some common factors include instrument damage during surgery, capsular contracture, compression due to mammogram or physical trauma, and normal implant aging. When a saline-filled implant (including the IDEAL IMPLANT) ruptures, it will get smaller (which is apparent by simply looking at the breast) and the saline will be naturally absorbed by the body. Silicone gel filled implants can rupture as well, however, unlike saline filled implants these ruptures are not immediately evident and are referred to as “silent ruptures.” Because silicone-gel is a thicker substance, it often remains close to the shell or within the capsular tissue surrounding the implant. Silicone-gel rupture complications can include misshapen or lumpy breasts, pain, tingling, and swelling. Silicone-gel can also migrate away from the breast area and form bumps. Because of the risk of a silent rupture, the FDA recommends women with silicone gel implants get a first MRI three years after they receive their implant, then again every two years after that for life. An MRI is the most effective way to detect a rupture in a silicone-gel implant. Capsular contracture, rupture, or dissatisfaction with results are just a few of the reasons the FDA has identified as the causes for breast implant reoperation, replacement, and/or removal. Breast implants are not categorized by the FDA as lifetime devices, which is something you should consider when researching the best breast implants for you. However, if your implant has not ruptured and you do not have any other complications, there is no need to replace your implants. In this sense, it is beneficial to pick a breast implant that has a low risk for the most common complications. If your implant ruptures, you experience capsular contraction, or you have any other complication, you should discuss options with your board-certified plastic surgeon. Some women decide to remove their implants entirely while others opt to replace them with new implants. Many breast implant companies offer a warranty for their implant. Be sure to read all the way through the warranty to determine what it will cover, and for how long. Planning for your future in this way can save you thousands of dollars down the road if you encounter complications. Your breast implants will be with you for many years, perhaps for the rest of your life. They can be a great decision and bring you confidence with your body. But what about peace of mind? Capsular contracture risk and rupture rates are easy things to research and share statistics on, but your own comfort and peace of mind are different. A recent independent survey of over 900 women found that 98% of women would be somewhat to constantly concerned about a silent rupture of their silicone gel implant. What this statistic tells us is the thought of a silicone gel implant rupture, even if it does not cause complications such as lumps, swelling, and tenderness, can make women worried. When you’re comparing the best breast implants for you, don’t forget to take into consideration your own peace of mind in the case of complications. Many women think deciding on an implant will come down to which will give them the most natural-looking results. While that is certainly important, risks, complications, and peace of mind should also be taken into consideration. Think about the lifestyle you want to lead, if you can afford future surgeries and MRIs, and your peace of mind day to day. When you’re ready to sit down with a surgeon make sure you pick one who offers all the breast implant options and can guide you through the benefits and compromises of each choice. A skilled, experienced, compassionate surgeon will listen to your questions and make time to ensure you are comfortable with your decision. The IDEAL IMPLANT® Structured Breast Implant is only available from certain exclusive board-certified surgeons nationwide. Visit the IDEAL IMPLANT surgeon finder to find one in your area. For more information about the latest breast implant technology and how it gives women beautiful results with peace of mind, visit the IDEAL IMPLANT website or find an IDEAL IMPLANT surgeon near you.